Home » Beauty » Washing a human hair wig — my Nth technique! Washing a human hair wig — my Nth technique! It’s time to switch to a more frivolous activity: how to get your wig properly washed! If you have been following my blog from the very first post, you’ll know by now that, over the years, I have changed the technique of washing my wig, and all that depending on the excellent advice I get not only online, but also from the wonderful person who sells and conditions most of my wigs. 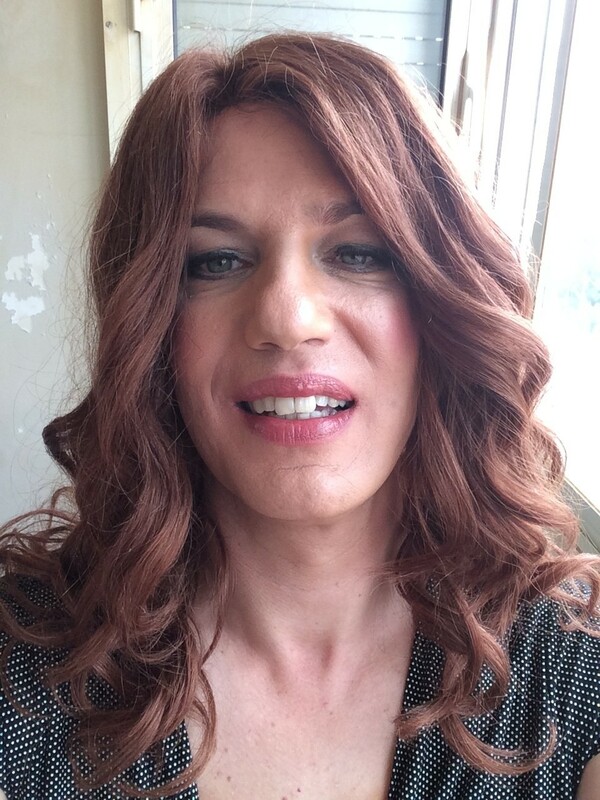 And then, of course, I get to exchange ideas with fellow crossdressers and transgender people who have not managed to fully grow out their hair. We compare techniques, exchange tips and ideas, and in general try to figure out what the ‘best’ method is. Over time, however, I came to realise that there are a lot of ‘myths’ about wig washing that simply aren’t true any more. They might have been true with earlier technologies of wig manufacturing; because wigs (especially human hair wigs!) can be very expensive, it means that hairdressers (and the community of wig users in general) tend to be conservative, that is, it’s best to advice to be extra careful than to risk ruining a good wig forever and getting an angry customer (or losing a friend!). Over the years, I have owned several wigs made of synthetic hair (some of which of extremely high quality) and two wigs of human hair, one of which I have given away when it was some 15 years old, but still relatively well preserved. Human hair wigs last way longer, and that’s one of the many reasons why they are expensive. They are also much more fun to play with, because you can style them in any way you wish (synthetic wigs come with a ‘fixed’ cut, which has been established by the manufacturers, and the synthetic hairs keep the ‘memory’ of that cut), although, yes, it also means taking some more time to get them styled first (while synthetic wigs just need a brush and are ready to wear!). Washing them, however, is pretty similar, and, in fact, I have noticed that almost everyone out there who wrote a tutorial for washing wigs does not differentiate between human hair wigs and synthetic ones. Synthetic wigs can have their hairs made of different materials and techniques, the most advanced and sophisticated being a Japanese invention, Kanekalon. It’s not a ‘new’ product, but rather something that the Kaneka corporation invented precisely 60 years ago and has been developing ever since. The current generation of Kanekalon synthetic hair fibres is ultra-light (as light as human hair) and heat-resistant; it’s so perfectly manufactured to resemble human hair that even experts (I mean hairdressers!) have a hard time figuring out the difference; the only good test is to set the fibres on fire, because plastic burns differently from human hair and smells differently too — but of course you’ll destroy the fibres that way!! Kanekalon-based wigs can pretty much be styled like human hair wigs using heat; and, because they are heat-resistant, it also means that they can be washed like human hair wigs. But there are still a few differences to take into account! Also, a lot of brands claim to use ‘Japanese fibre’, giving the impression that they are using Kanekalon, when in reality they are using some cheap substitute ‘made in China’. Now, Kanekalon is not the only player in the market; there are a lot of high-quality synthetic hair fibres out there, some of which are close enough to ‘pass’ as Kanekalon fibres (or even human hair!). For a lay person they might really be undistinguishable. I do have an older wig which was sold as being ‘100% human hair’, but the price is definitely not right for a real human hair wig. When feeling those fibres and comparing it to the human hair wig I’ve got, the difference is so minimal that, with my eyes blindfolded, I might confuse both — that’s how good some synthetic fibres are these days! That’s why I have no qualms to recommend to new crossdressers to invest in a good, high-quality synthetic wig: nobody will know the difference, and they are much easier to maintain, because they keep the style even after washing and heavy brushing (although you can change the style with heat on Kanekalon wigs!). Why use human hair wigs then, if the difference is imperceptible? Well, I have told this in the past, and I will repeat again: in general, human hair wigs, with proper maintenance, will last much, much longer. At the rhythm I wear them, a good quality synthetic wig will last me 6-12 months — after that, the ends will be so split, feeling like raw straw, that the wig is not useable again. A human hair wig, if properly maintained, can last a whole decade. That, however, really requires a lot of tricks, some of which I will reveal today. Human hair wigs are also less irritating, at least to people who are susceptible to allergies; you will perspire less under a human hair wig than under one made of plastic, even if it’s a well-ventilated one (as is commonplace today among the better class of wigs). Loose, stray hairs will not irritate the skin as much — it’s just human hair, after all, even if it’s not your hair. And, of course, you can have way more fun in styling them, although I guess that you will be able to accomplish the same results with a Kanekalon wig — the main difference is that you might not need any heat to do some simple things with a human hair wig (I use rollers! ), while even the best Kanekalon wig will need huge amounts of hair spray to be tweaked into the style you wish — or you will be an expert in manipulating all those heating tools to accomplish the same result. So, yes, there are advantages and disadvantages for each type of wig. Now, the first lesson you might get when washing your wig for the first time is that you have to pay extra attention to what products you buy, because they might affect the wig (or even destroy it). Twenty years ago, when I first started to wash my wigs, I was told never to use any product with alcohol (that means no perfume) in it — the main reason being that alcohol will dry out the wig, and both synthetic and human hair wigs are already ultra-dry. But several chemicals might also interfere in the way the wig hairs have been manufactured, which meant being very careful with what one would buy — it often meant ordering from special shops, retailing to hair salons, selling products specifically for wigs and hair extensions. Such products are usually expensive, but the advantage is that they also come in large bottles. While this is understandable for synthetic wigs, is there any need to be careful with human hair wigs as well? The answer is ‘yes’. Even though the raw material for a human hair wig is, indeed, human hair, only those with virgin human hair have ‘untreated’ hair. Virgin hair is often more expensive and comes in very few colour choices, except for European hair (which is used only by the top of the top of the luxury brands, since it’s insanely expensive) — this is because the most available kind of human hair comes from India and is therefore mostly black or at least a very deep and dark brown, and mostly straight or with a slight wave; some comes from China (Chinese hair is stronger, but also thicker, which can limit what you can do with it) or Vietnam (similar to Chinese hair but sometimes slightly cheaper), which is also black and completely straight; and finally, Brazil also exports plenty of human hair, which is often also very dark and very curly. Thus, to get any other shade, virgin hair needs to be bleached first. This is a process that uses much more aggressive chemicals than what is used in salons for natural hair, since it is something that will be mass-produced in a large factory, without the fear of harming anyone. The bleaching process naturally also damages the hair much more than it would damage one’s natural hair, but since human hair wigs are not supposed to last forever, they know they can go extreme with that bleach. Then a dye is applied to the hair. Again, this is a much stronger — and chemically way more powerful — kind of dye than what is commonly used at salons. It will not go away even with lots of washing: the older human hair wig I had, which had a copper red, remained with pretty much the same shade and colour after 15 years. My current wig has not changed its colour in the past two or so years even after the frequent washing (every other week or so), while dye from a hair salon usually fades after a few weeks, or at best after a few months. Naturally enough, such aggressive treatment will weaken the hair, and that’s why it goes through a few more chemical processes to keep it in good condition for a long time. It’s also possible that some hair will go through special chemical ‘baths’ to make them more (or less) wavy, for instance. But due to all these manufacturing processes, the end result is not exactly natural hair, and that is one of the reasons why processed human hair seems to be so similar in texture and properties to high-quality Kanekalon fibre: both kinds have been through complex chemical processes until they are finally weaved into a wig. Both are the results of heavy-duty industrial manufacturing. And here is where the first ‘myth’ is born: because processed human hair (the more usual type) has already undergone so many aggressive chemical treatments, washing it (and maintaining it in general) ought to be done very carefully in order not to destroy the whole hair. This might have been a real issue decades ago, when industrial processes were quite different, but… I have found out that there has been some exaggeration in the ‘fragility’ of modern-generation human hair wigs. They are much stronger than what the sellers claim. Perhaps they are only shielding themselves to avoid lawsuits, I don’t know — with human hair wigs costing up to something like €5000 (! ), it’s clear that manufacturers do not want their customers to spoil the wigs after the first washing and sue them! So, how ‘careful’ should we be with a human hair wig? Well, careful enough: what you should keep in mind is that a human hair wig ought to be treated as having very dry and damaged hair which has undergone the equivalent of many bleachings and many dying operations. That means that it’s fragile, yes, and just grabbing the first bottle in the supermarket might not be the best choice. Fortunately for us, real women also have dry hair, and they also bleach it repeatedly, and also dye it — often in low-quality salons who don’t know what they’re doing — and they get their own real, natural hair very damaged. And this has made a whole industry popping up into existence for dealing with so-called ‘dry and damaged’ hair — exactly what we need to take care of our human hair wig! Fill a basin with cold water and dilute a handful of shampoo in it. Use a shampoo without perfume and without alcohol; ideally, a product designed for wigs and hair extensions; if not, use something for ‘dry and severely damaged’ hair. Brush your wig carefully but vigorously, making sure that it does not have knots anywhere. Very gently place the wig inside the water, making sure that it retains its shape even after being immersed in water — that is, if it’s a long wig, don’t separate the many strands, but try to keep them together. Slosh it very gently around, still making sure that it maintains the overall shape — if it doesn’t, you’ll get a lot of tangles in the hair, and it will be a mess to untangle it (and very likely you’ll loose a few strands in the process). Wait for 15-30 minutes. So, no rubbing, no vigorous scrubbing, like you would do to your own hair. No, the wig is supposed to be left in place and let it soak the water and shampoo. Now rinse it by filling a basin with fresh, clean, cold water, and immersing the wig repeatedly into it. This will probably take a long time (more on that later). Repeat step 1, but this time with conditioner. Again, select a conditioner for ‘dry and damaged hair’, without alcohol, etc. Go through the remaining steps. You’ll notice that the conditioner takes way more effort to get out of the hair; you’ll need a lot of more clean water! And it’s very important that you get the excess product out of the wig, or it’ll look terrible after drying out. You might wish to add a hair mask after the conditioner. Or replace the conditioner with the hair mask. Your choice! I usually do both, unless I’ve not got enough time, then I just do one of them. Note that the quantity will be pretty much the same in all cases, i.e. for long hair, about a handful of product. Hair mask works better if you rub it into the hair, however, but because this is supposed to be ‘dangerous’ to do, just let it get absorbed slowly. Do not hair blow the wig; if you’re really in a hurry, you might have no other choice, but then use just cold air to dry it (yes, it will take eternities; but heat might damage the wig…). Instead, what you should do is to place the wig very gently — again, making sure that it’s still in the same shape! — on top of a towel, cover it with a second towel (or use a long one folded in two), and gently tap on the wig with the palms of your hands. Do not rub the wig, as you would do with your natural hair! The tapping is actually very efficient and will set loose a surprising amount of water (in fact, I have tried the same method with my natural hair, and, yes, it works even better than rubbing and scrubbing with the towel; the difference is that you ought to rub your scalp once in a while — it’s a kind of massage! — because it’s good for it; that’s why we learn as kids to vigorously rub our scalp and hair). Comb the wig very carefully, starting with the ends and slowly working towards the roots, but be extra-careful at the top, so not to damage the wig cap. Use a wide-toothed comb, like in the picture; I personally prefer a wooden comb than a plastic one, because wood will not accumulate as much static electricity. After it dries, it’s highly likely that you’ll need to comb it again. All right, if you look it up on the many sites on the Internet, you’ll see a few variations on the above method; the differences, however, will not be huge. For instance, some might suggest using warm water instead of cold one; not hot but mildly warm, because most shampoos and conditioners are designed to work at around 40-45ºC or so, which is the water temperature used by most people when taking a shower. Also, there will be not much difference between the techniques used for synthetic wigs and for human hair wigs. The only exception is the so-called ‘microwave restoration’ method for human hair wigs: basically, you put a lot of hair mask on the wig, place the wig inside a plastic bag, and microwave it. Sounds crazy? Yes, but there is some science behind it: the mask (or eventually conditioner, it should work as well) will get heated and penetrate the hair fibres much better, while not damaging the wig in the process. Why? Well, it’s due to physics really. Microwave ovens essentially heat things up by getting water molecules to vibrate at much higher frequency (the higher it is, the ‘hotter’ it becomes). Because all our food is made of essentially water, this works well for heating food. But all hair products contain a lot of water molecules as well, so it reacts quite well to microwaving; while natural hair, by contrast, doesn’t contain that much water (as said before, human hair wigs behave as ‘dry and damaged’ hair), so it will be much less affected by the microwave oven itself — which means it won’t be damaged in the process. In other words: you’re heating up the products used for hair treatment, which work better at around body temperature, while not heating up the wig hair itself and therefore not damaging it. For the record, yes, I have tried this out on what was sold to me as a ‘human hair’ wig (I have no way of telling if it is or not), and it made an impressive difference — the hair was silky and shiny as never before, not even when it was brand new! There was just a catch: my microwave oven is not big enough for very long hair, so, unfortunately, there was a bit of hair that was ‘folded’ (I didn’t notice it when placing the plastic bag inside the microwave oven), and, because even the heated-up conditioner/hair mask will also heat the wig hair to a degree (just not as dramatic as, say, a curling device), it was enough to get a permanent kink on the wig, which was a shame, since it was otherwise wonderful. The microwave technique ought only to be used with virgin hair, because one never knows what kind of treatment it went through to get the current colour; it’s plausible that water-based dyes have been used in the process, and, of course, these will be heated up by the microwave as well with unpredictable results: with luck, nothing happens; with bad luck, the dye might fade, or smudge, or somehow chemically react with the hair and damaging it permanently, I don’t know (and I don’t want to experiment!). Vintage hairdressing: the benefits of rollers! A much more peaceful form of ‘treatment’ is using hair rollers. These can be used both by synthetic wigs and human hair wigs, although, because synthetic wigs have ‘memory’, the effects on human hair wigs will be dramatic. There is actually a lot that can be achieved with hair rollers. You might have noticed that they have different diameters. The larger ones are mostly used for creating volume; the smaller ones are used for creating waves and (possibly) fixing some split hairs. If you only wish to add more volume, this is the easiest thing to do: just get separate strands as close to the top as possible, and roll them up, from the sides and behind, and that’s it. The wig should dry with the rollers applied, and it’s best if you can wait one day until you remove the rollers. They might give the wig a slight wave (it depends on the kind of human hair you’ve got), but the more visible aspect will be the illusion of more volume. Synthetic wigs will not benefit much from this technique. You can also get slight waves or curls by using the smaller rollers. These are usually applied at the bottom layers of the wig, so that the curls are more visible that way. If you roll the strands in the front laterally or diagonally, you’ll achieve the same kind of curls as with an iron, with the difference that no heat is applied. They will not last long but they will look great (and natural!) while they last. Nothing forbids you to use the smaller rollers all over the wig to get it wavy all over; it works to a degree. But if you wish more permanent curls — the kind that will last at least a whole evening going out dancing! — then the trick is to hair-spray them while they’re drying, and just removing the rollers when the hair is totally dry. Again, using this technique on synthetic wigs will have not much of an effect, although if the fibre is good enough, the hair-spraying technique should work well. Now, to fix split hairs, the trick is to use the smaller rollers just at the tip of all the strands. In other words, instead of rolling the strands up to the roots, you just roll them one turn or so. This works on both human hair wigs as well on synthetic ones, and you can repeat it as much as you wish, it won’t damage the hair — rather the contrary. Of course, again, we’re just creating an illusion that the hair is not split, by placing the ends ‘artificially’ together, letting them dry all close to each other with a gentle curl at the end. Sometimes that’s enough. On a very damaged synthetic wig, however, there will be not much hope for such extreme cases: the fibres are completely broken down, and they will not look better just by curling them with rollers. On human hair wigs, however, there is still some hope left: using serums specially designed for split hairs. What they do I have no idea, but I’ve noticed that all of them include paraffin, or at least a paraffin derivative. Paraffin, of course, is a subproduct of petroleum, and not everybody will want something like that on their wigs (or natural hair! ), but if you have no qualms about paraffin, then it might be just the product you want: it will coat the hair strands at the very tips with a thin layer of (invisible) wax, enough to ‘close’ the split end, and hold on to whatever moisture is inside the hair (which will be not much on a wig). It will also protect the hair against future splitting; this is particularly useful on relatively long hair (shoulder-length or longer), because it will be constantly rubbing against clothes and chairs and whatnot, and be subject to splitting much easier. Paraffin helps to protect the hair for longer periods. The way I apply it to my human hair wig is simply by placing a little bit of the serum in my fingers, slip them through the last 10 cm of the strand or so, and rolling it up. This will give good results on human hair wigs; I have no idea what happens on synthetic ones because I haven’t tried it out! I have also asked around about any side-effects from frequent usage of paraffin-based serums on human hair wigs, but it looks like not many people have written about those, or that I haven’t been thorough enough in my searches. The truth is that people use those on their natural hair, and have done so for years, and as far as I know, they haven’t had any problems; then again, natural hair grows, and you can always cut the split ends — an option you don’t have with a wig (unless you’re fine with shorter hair, of course!). In the past few months, my wife and I really had to cut our costs to a bare minimum, and that meant saving money to get my regular wig maintenance by doing it myself at home. For the past months, I’ve noticed that the wig was needing more frequent washes, which is usually a bad sign (perspiring like crazy is also not necessarily good for the wig; alas, I cannot do much about that on hot days… and that means washing the wig more frequently, too). And it got more tangled as well — yet another bad sign, namely, that the ends were starting to split so dramatically that they would entangle themselves with the nearest strands, making a mess out of it. I do own a detangling comb which works quite nicely, but there are limits to the miracles it can achieve. Sometimes you get such strong knots on the hair that the strands are simply ripped apart — there is nothing you can do about it. Yes, I use a few sprays to help to untangle hair, but… as said, there is a limit to what you can do. A month ago or so, something terrible happened — something which I had only encountered a few times before in my life as a wig owner, and it meant either sending the wig straight to my specialist wig hairdresser, or, well, throwing the wig away. Basically, after carefully soaking the wig in cold water, and swirling it around very gently, suddenly almost all strands get tangled together — you basically get what I call a ‘soaked rat’: a huge mess of incredibly entangled hair, so much, in fact, that you have no wig any more — you just have a ball of tangled hair. This happened perhaps half a minute after placing the wig into cold water. I did brush it before dropping it in the basin, just like I always do. I made sure that there were no visible tangles. But… for some mystic reasons… sometimes you get the ‘soaked rat’, no matter how careful you are. The last time this happened to the very same wig I took over two hours to untangle it; I lost some hair strands in the process. But this was worse. Much worse. I had never seen a wig so dramatically tangled before! Incredibly frustrated, I started the long, painful process to untangle strand by strand, as far as possible. I got some reasonable progress, until I stumbled upon four mega-knots, which would use up half of the wig’s hair or so. These seemed to be absolutely impossible to untangle, no matter what I tried. I was getting desperate. My wife wondered what was taking so long, and took pity on the ruined wig, or what I thought that was a ruined wig, and tried to help me out. She quickly came to the same conclusion as I did: that some of the knots had to be ripped apart, there was really not much to be done about that. I was just hoping that enough strands would remain to make the wig still wearable. And fortunately that was the case. Sure, the wig lost some of its volume, but after a couple more hours, it was untangled — with lots of hair missing. Well, the truth is that I had no other choice. I couldn’t even afford some professional maintenance, much less a new wig. So I had to be content with whatever I managed to salvage from the ‘soaken rat’. For a few days, things worked out fine, the wig was still acceptable for wearing. Then I went through a few crossdressing sessions where I perspired like crazy. I tried to avoid washing by using the dry shampoo and the dry conditioner I had. This worked to an extent, but soon it became clear that something more dramatic was needed. I’ve been using Schwarzkopf’s BC Repair Rescue Sealed Ends for quite a while (the prices around here are higher than on Amazon! ), but that’s something you shouldn’t use too much, which soon became sort of a Catch-22: if I use it thoroughly (especially on rollers, as described before!) then it was clear that the hair would look ‘as new’. However, possibly because of the paraffin, or the way it interacts with the hair (I don’t know enough about hair products to tell), it also meant that the wig would need to be washed sooner — or I’d get a ‘wet look’, with thick, weighty hair strands (although healthy-looking ones!). I prefer that to a looser, lighter look where all the hair is split, of course, but I yearned to get the wig light and shiny again. Still, there was no way to further way to delay washing the wig. So, with a sigh, I thought, oh well, either this will work, or it will be the last day of my human hair wig — and I would have to fall back to an old synthetic wig I’ve got stored for an emergency. So what did I decide? To break all the rules. After all, what got the wig tangled in the first place was that immersion in cold water and the gentle sloshing around. Once it got tangled that way, I never managed to untangle it — not with the conditioner, not with the mask, not with the untangling sprays I’ve got. Well, my mind worked the following way: this particular wig is undoubtedly made of human hair; it comes from a very respectful Italian brand specialising in wigs for women who underwent chemotherapy, and was sold by my wig hairdresser, who is also honest about the things she sells at their salon. It might not be made of the most expensive human hair out there (it’s not expensive enough for that), but I can assume that it’s made of the finest quality Indian Rémy hair. Sure, it was blanched and dyed, and probably got a few extra layers of chemicals as well; but, in essence, it’s nevertheless human hair and responds well to treatments designed for extremely dry, brittle, and damaged human hair. If this is how to properly wash your natural hair, why do it differently with a human hair wig? So I should wash it like I wash natural hair. Right? It just seems logical! Well, maybe it’s not, but after carefully combing the wig to make sure it had no knots and tangles,I decided to wash it the ‘normal’ way. And this meant using the shower head set to a ‘normal’ temperature (around 42ºC or so), holding the wig in my hand and letting the water flow naturally, from the top of the wig to the ends. And to make sure the hair didn’t get tangled, I was constantly combing the wig with a wide-tooth comb. Next came shampooing. As said, I use a shampoo for ‘dry and damaged’ hair. Here I was a bit more careful: starting from the top and slowly working a lather down to the roots, I didn’t scrub the hair vigorously, but merely let the shampoo flow naturally to cover the whole hair surface. Apparently you ought to do it on natural hair anyway. Again, I used the wide-tooth comb to make sure no strands got tangled. So far, so good: the hair seemed to be properly washed and shampooed, and I had zero tangles in it, so it was time to rinse it, and apply conditioner. In the past, even when the wig was relatively new, and when I did wash it the ‘recommended’ way (i.e. just gently soaking it in cold water in a basin), I noticed that once the shampoo was off the hair, it started immediately to tangle, especially down at the split ends. But this didn’t happen this time. It remained tangle-free! Why? I can only speculate that the combination of using the shampoo at the water temperature it was meant to be used and the wide-tooth comb to make sure no nasty knots popped up, made a whole world of difference. Next it was time for the conditioner. Unlike the shampoo, it’s not meant to be used on the roots, so it’s supposed to be applied only from half-way until the ends. I don’t know if that has something to do with the way the conditioner interacts with the delicate roots or the scalp itself. Wigs, however, don’t suffer from the same issue, so I tend to apply the conditioner almost to the top. Modern-day conditioners act very quickly, a minute or so is usually enough to get it ‘activated’ (or whatever happens to conditioners while you wait that minute). When using cold water, however, things are different; again, conditioners are supposed to be ‘warmed up’ to body temperature or thereabouts. This is why some wig washing tutorials say that you should let the wig be soaked into water with dissolved conditioner for several minutes. This eventually works, but now I start suspecting that the conditioner will not get totally activated that way. I don’t know, it’s just the way I would chemically design hair products: for storage, they are usually stored at ‘room temperature’, i.e. something between 20 and 25ºC; for activation, even if you shower in cold water, at the very least the hair (even long hair) will be close to body temperature. What that means is that hair product manufacturers have a margin for storage versus activation — if I were a chemical engineer designing such a product, I would make it only get activated at around 30ºC or so, and put a label on the product to store it ‘outside direct sunlight’ or ‘not close to sources of heat’. No such labels or warnings are on the products I use, so I can only speculate that this is the way they work. They can also be activated — ‘cured’, I believe that would be the word — just by contact with air, or any substance contained in hair (which would be harder to do, I guess, but not impossible). Whatever the actual chemical mechanism is, the truth is that most people do not wash their natural hair with cold water and let it soak the products by putting them in a basin. Instead, they put the products on their hair and let it stay there for a while. Needless to say, I continued to use the comb over and over again, making sure that no strands got tangled, even though that is highly unlikely when applying conditioner (part of its action is to detangle hair, after all). Still, combing the hair also helps to distribute the product more evenly. After that, it was time to rinse the wig again, using the comb once more, and apply the hair mask, which is pretty much applied just like a conditioner. In fact, some people tell me that it’s overkill to do both a conditioner and a hair mask, but that’s what I have been doing for years, so I stuck to my routine. Again, because the hair mask was applied on warm hair (i.e. warmed up to body temperature or so), I didn’t wait for as long as I usually do (sometimes even an hour!) – the mask is supposed to reach the peak of its chemical activity after a few minutes. And then it was time to rinse once more. Conditioner and hair mask take a lot more water to remove properly, and it’s not so easy to figure out when all the product is removed, since it is supposed to leave the hair soft and shiny, with a smooth texture. I just basically ‘overdo’ the rinsing – my wig hairdresser tells me I use too much product anyway – but always, always made sure to properly comb the wig all the time. At the end of the whole process, I had a perfectly washed and cleaned wig with zero tangles, knots, or any such irregularities – exactly what I wanted! Surprise, surprise: it never looked so good! Seriously! To give it the finishing touch, I added the Pantene serum and combed the wig with a super-extra-fine metal comb (it’s supposed to be a comb for my cats! ), since that would make the strands visually very fine. And then I had one of those ‘wow’ moments: it had been months, or years, since the wig looked that great! It looked better than new – well, minus the issue of having lost so many hairs over the years, especially on the last wash, but… the ends didn’t seem split, the wig was glossy and shiny and super-light, like I had never seen it before! There is, of course, a catch with this technique: it works only on straight hair, or hair with a natural wave (which seems to be the case of my own wig). If you have styled your wig with curls or extreme waves, then the constant combing under water will very likely make it straight again. In that case, you might not have any other choice but keep the wig soaked inside the basin of water, and hope that it doesn’t tangle… even though you might try out using lukewarm water instead of cold water, to let the products get activated. Also, I have no way to know if I was merely lucky and didn’t destroy my wig in the process; or if with repeated washing using this technique the wig will have a much shorter lifetime than by using the traditional method. And, obviously enough, I have no idea if the same technique will work on synthetic wigs, even those made of Kanekalon. All I can say is that normal shampoo will work perfectly on good-quality synthetic wigs (if you pick a shampoo for dry hair, that is), since that’s basically just to take the dirt away. Conditioners and hair masks… well, those are supposed to go deeper than the surface, to repair things beneath, inside the hair itself. If it works or not on synthetic fibre, I have no way to tell. Consider only that natural hair is, by definition, dead tissue (at least the visible part of it) — it doesn’t have any biochemical activity inside it anymore. So, in theory at least, it’s not much different from synthetic fibres — whatever products you put on your hair cannot rely on any biochemical activity inside the dead hair cells (unlike, say, skin products), but have to rely on its own chemical properties. On the other hand, natural hair is basically keratinised dead cells (as the cells at the follicle die, they are covered with keratin to stick together) — keratin being one of the many proteins made by our body; while Kanekalon is a sort of modified acrylic, that is… a form of plastic. Clearly, what will work on an organic protein will possibly not work on a plastic; the chemistry is way too different for that. In conclusion: wigs made of human hair underwent many chemical treatments (except for virgin human hair), but they still retain a lot in common with natural hair. It is therefore not stupid to assume that the way we wash and maintain our natural hair also applies to human hair wigs. In particular, we ought to recreate the same environments in which we apply certain products to our hair; possibly they are meant to be gently warmed up to body temperature before becoming active. Soaking wigs in cold water with a dissolved product may be the only solution for cleaning low-grade synthetic wigs, but higher-end human hair wigs ought to respond better to washing and maintenance in exactly the same conditions as natural hair.